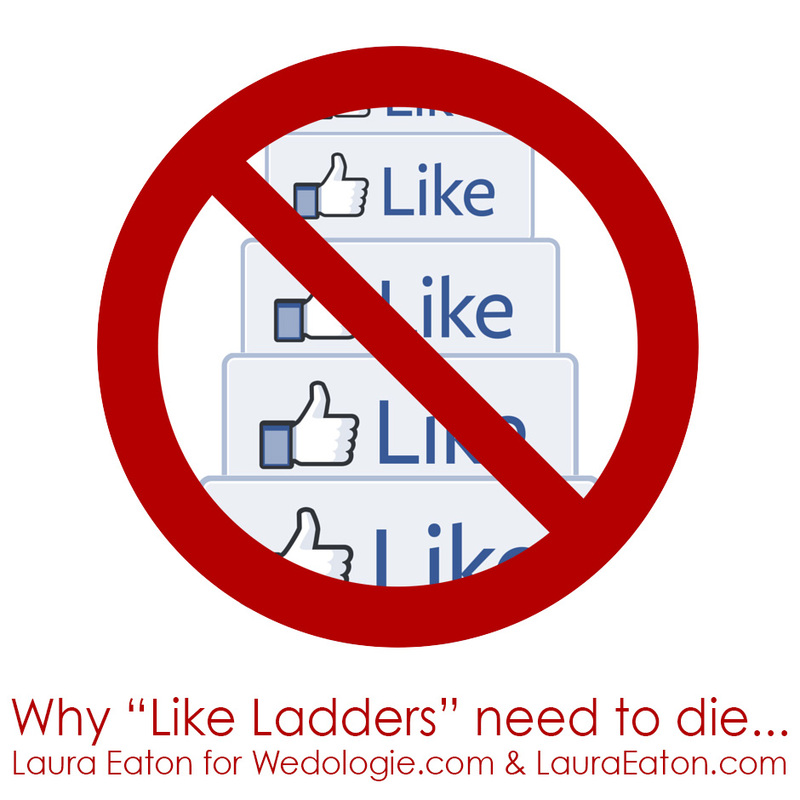 Value of Likes on Facebook, and Why Like-Ladders Need to Die…. Ok everyone, I know this is hard, and we tried our best, but I have to call it… Like-Ladders on Facebook, it’s over – time of death: March 5, 2015. I belong to lots of wonderful groups on Facebook and at least once a day, someone will post a “Hey, let’s drive engagement and Like each other’s pages!” and in theory, that sounds great – you are supporting each other, you get some Likes in return – win, win situation right? Wrong. Unless those new Likes come back and continue to engage with your page; comment on your posts, continually Like your new images, etc, its all for naught. Facebook allows you to organically reach approximately 6% of your audience, and of those 6% goes for those that connect and seem really invested in your business (this theory is debatable, but lets face, we are talking about 6% here, is not like it matters that much). But you pay to boost posts? Well now, you are reaching 10%, more or less depending on what you are willing to pay – but you are reaching these diluted Likes, these people from these Like-Ladders aren’t likely your true audience, your potential clients. They are other people in your industry who were trying to do you a favor by liking your page, but now you have these not-ever-going-to-be-a-customer Likes taking up valuable reach when you pay to boost your post or promote your page. See where I’m going with this? So what can you do? Take the engagement to where it matters, your website. When these Like-Ladders show up, instead of posting your Facebook page link, post a link to your latest blog post, or if you are really brave and truly trust the people in your group (lets assume you have an awesome group full of previous clients – kudos to you by the way!) post a link to places they can leave you a review. Google loves engagement on your site. Every time you get a new comment or page view, you have a better chance of moving up in search results. This will help boost your SEO and – unlike that previous holy-grail of “Likes” – is truly valuable. So let’s do this – please go ahead and SHARE this article and please leave a comment at Wedologie.com if you are in the wedding industry – small biz or entrepreneur? Feel free to leave some love at LauraEaton.com – and of course leave links to your articles & posts on your WEBSITE (not FB page) in the comments here to hopefully get some meaningful engagement. And of course I don’t mind if you “Like” this on Facebook – let’s face it – I’ll take any portion of that 6% I can reach! This is very true. Im not a huge fan of facebook. True that! Gaming the system will inevitably fail, and in worst-case-scenarios, come back to bite you once Google finds out a way to penalize you for like ladders. BTW Nice to see you writing this site, Laura. Hope all is well! Thanks so much Ryan! And my apologies that I just saw this comment! I’ll be emailing you soon!